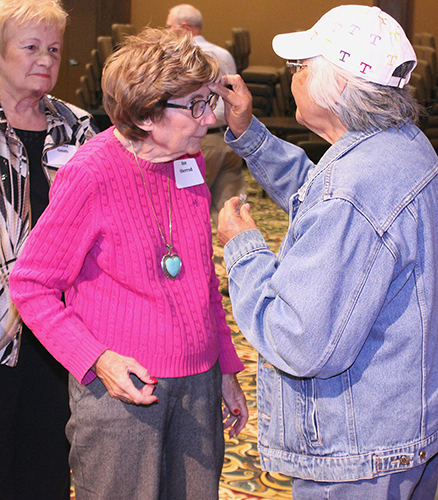 The mission of the Conference Older Adult Ministries Council is to resource churches and individuals in the Conference on all aspects of aging and older adult ministries. Audiences include leaders in local church ministries, ministers and church staff, senior adults themselves and adult children of seniors. The Council also presents workshops at various Re-Ignite workshops. Resources on the page include links to websites of church, private and public agencies that provide information on many different topics related to senior adults from health to spirituality, and fraud to end of life concerns to name just a few. People resources are listed such as members of the Council who are willing to speak at churches on various topics when invited and contact information for those who can serve as consultants for churches as they plan ministries for, with and by seniors. Finally, there is an extensive listing of books arranged under several different topic headings. Subscription for print copies are available. Topics: “Establishing a Care Ministry in a Local Church," Alzheimers and Dementia," "Caring for the Caregivers," "End-of-Life Issues," "Grief Issues"
Topics: “Starting or Strengthening an Older Adult Ministry,” “Blue Zones Updated." "Maturing in Christ as Spiritual Formation, the Role of Prayer"
"Health Care Challenges of Aging in the 21st Century"
"Holy Conferencing and Pastoral Care"
"Training Independent Seniors for Stephen Ministry in Retirement Communities"
"Moving into the Epworth Villa Community"
Some say that only the young can do mission for God but we have found that not to be true at SunnyLane UMC. Our senior adults are very busy being in mission helping others. Two of our members I would like to highlight this month are Roger and Nancy Goeller. They are an older couple devoted to God's work and have been for many of their 80 years. Both love singing in the choir and Roger finds great pleasure in playing the saxophone in the church orchestra. Nancy also sings in a women's choir, The Heartland Singers. We see Roger at many church functions with his camera taking pictures and posting them on our Facebook saving many wonderful memories for our church family. We often find both of them in the kitchen preparing delicious meals for different groups at church. One very important ministry they do every Sunday that many are not aware of is faithfully preparing the elements for communion. Their ministry extends beyond the local church and into the community by volunteering many hours at blood drives and health fairs. Nancy helps by calling and Roger helps by being an OBI tour guide and in driving vans for OBI for out-of-country guests. He also takes photos for OBI when he is asked to do so. Roger and Nancy have had their health issues as many of us have as we grow older, but they have decided to never give in and always answer God's call on their lives with, "Yes, we can" and we can too no matter our age or condition in life. If God lays on our hearts a job to do for Him He will also give us the strength and ability to get it done. Yes, He will. AARP - www.aarp.org/ - has many helpful resources for people over 50 including health and consumer information such as alerts of frauds aimed at seniors. The American Society on Aging: www.asaging.org/ is mainly an academic organization but under the “Education” banner at the top of the homepage then the “Topics” tab, there are helpful articles on subjects such as “Aging in Community,” “Helping Elders at Risk Because of Hoarding” and even Religion and Aging. Helps eligible individuals in crisis with assistance not available by another source in community. Funding for this program is through special grants and private donations. Provide 6 week workshop series. These provide strategies to improve health one step at a time. Participants learn better ways to sope with chronic illness. An Ombudsman acts as an advocate on behalf of residents living in long-term care facilities by advising residents of their rights, providing information, resolving problems. Trained volunteers visit facilities regularly. Ombudsman Supervisors provide training and support for volunteers. Transportation services are provided to older adults who have limited or no other access to transportation sources. Trips are provided to nutrition sites, medical facilities, grocery stores, and other necessary destinations. Provide for the recruitment and coordination of area churches and organizations, which prepare and deliver meals to homebound elders. The program is comprised of more than 80 organizations preparing and delivering of meals to homebound seniors who are 60+. Provides vouchers each quarter to allow the caregiver to hire an individual to provide respite. Information and referral staff of Areawide Aging Agency which connects individual Seniors, caregivers, family members, and professionals to resources in the community which may best meet their needs. The division also compiles and publishes the Survival Kit for Seniors, a 200+ page resource directory. Provide hot, nutritious meals for senior citizens 60+ on a daily basis. In addition to serving balanced lunches, these centers provide consumer information, nutrition education, health and welfare programs, and recreation activities and homemaker services. Oklahoma county Senior Nutrition Program (405) 949-2709 Sunbeam Family Services – (405) 528-7721 – “Caregiving Fundamentals” training is provided in Canadian, Cleveland, Logan and Oklahoma counties. Training is designed to provide practical information as well as resources for assistance and support to those in a caregiving role. This resource focuses on persons' faith stories; memory of God's presence in one's story becomes a seed of faith. Excellent for group or individual use for journaling and in retreat settings as persons chronicle the faith events in their lives, leaving a spiritual legacy for future generations. Living Fully, Dying Well by Reuben Job. (Abingdon: 2004) Available as a Participants book, plus a Leader’s Guide and DVD designed for eight sessions. Our best decisions about life's most important events are seldom made in a time of crisis. This book is designed to assist us in making careful, wise and prayerful preparation for meeting life's most important moments. No Wrinkles on the Soul: A Book of Readings for Older Adults by Richard L. Morgan (Wipf & Stock Publishing, 2013 – new issue of an old classic) From "No Use Denying It" to "Keeping the Spirit Renewed," Morgan offers six themes in his best-selling book, which is now in larger print, that are on target for older adults. The 62 meditations in No Wrinkles on the Soul are ideal for individual or small-group devotions for those seeking to further develop their spiritual wisdom. Each meditation presents a suggested scripture reading, a printed Bible version, and a reading for reflection. These meditations relate honestly to the variety of situations in which older adults may find themselves living -- in their own home, in a retirement center, in a nursing home, or in the home of a relative. Not listed by Cokesbury but it is on Amazon. Ten Gospel Promises for Later Life by Jane Marie Thiabalt. (Upper Room Books, 2004) [Large Print] Gerontologist Thiabalt addresses the fears and challenges that face us as we age and helps seniors deepen their spiritual life by reflecting on promises found in the scriptures. Building a Ministry for Homebound and Nursing Home Residents by Marie White Webb. (Discipleship Resources, 2003) An excellent guidebook for doing ministry with homebound and residents of continuing care retirement communities. Guide to the Spiritual Dimension of Care for People with Alzheimer's Disease/ Related Dementia: More Than Body, Brain and Breath by Eileen Shamy (Jessica Kingsley Publ., 2003) The main concepts of the book, those of spirituality, retained through dementia, and personal worth should be acceptable to people of most world faiths. Shamy draws heavily upon her experience, making this book very personal in its approach. The anecdotes anchor the book in the realm of what can be done rather than the theoretical world of the "maybes." No Act of Love is Ever Wasted: The Spirituality of Caring for Persons with Dementia by Richard L. Morgan & Jane Thibault (Upper Room, 2009) Relying on their many years of experience in this area, the authors offer this book to provide a fresh, hopeful model of dealing with life and death in the realm of Alzheimer's and other forms of dementia. Caregivers have two basic needs: affirmation that care giving is not in vain and reassurance that the lives of those for whom they care are not being lived in vain. Care receivers need more than medical attention; they need tender care, involvement in the community, and a sense of connection with a loving God. Living Fully, Dying Well by Bishop Rueben P. Job (Abingdon Press, 2006) This study, which contains a leader’s guide, participant workbook and video is designed to assist people in making careful, wise, and prayerful preparation for meeting life’s most important moments. Beyond the Broken Heart by Julie Yarbrough (Abingdon, 2012) How does the heart understand grief when it is broken by the death of a loved one? To survive and live forward, those who grieve must find answers. Leader’s Guide, DVD and a year of devotionals. practical advice to families, caretakers, and churches. Christian education and Older Adult Ministry in the UMC. See also Mayo Clinic’s Guide to Alzheimer’s Disease under Caregiving. Comfort Zones: Planning a Fulfilling Retirement (5th Edition) by Marion E. Haynes (Crisp Learning, 2005) The resource brings together all the major aspects of retirement, including relationships, health issues, use of time, living arrangements, finances and more. The Power Years: A User’s Guide to the Rest of Your Life by Ken Dychtwald and Daniel Kadles. (John Wiley & Sons, Inc., 2005) A guidebook to help midlife and older adults realize their potential by redefining expectations. Purpose and Power in Retirement: New Opportunities for Meaning and Purpose by Harold G. Koenig, MD. (Templeton Foundation Press, 2005) Book and audio CD. This resource encourages retirees to make a meaningful difference in the world. Reimagine Your Retirement: How to Live Life to Its Fullest and Leave a Lasting Legacy by Joyce y. Li (World Alive Press, 2013) Do you worry about your future finances and health? Do you struggle to find meaningful living? Do you have a nagging dream that has yet to come true? Imagine being in love with yourself and others, enjoying what you do, and living life to its fullest. This book will equip you to unleash your full potential. Shaping a Life of Significance for Retirement by R. Jack Hansen and Jerry P Haas. (Upper Room Books, 2010) Retired engineer Jack Hansen and spiritual formation leader Jerry Haas explore the transitions, opportunities, and challenges of facing retirement through a series of interviews with persons facing and in retirement. It is about the more personal dimensions of the transition from working full time to retirement, including relationships, feelings of self-worth and purpose, and spiritual and intellectual growth. Aging and Ministry in the 21st Century: An Inquiry Approach by Richard Gentzler. (Discipleship Resources, 2008) A Comprehensive overview of the subject. “Inquiry approach” means that there are many questions for response throughout the book and it is designed to be used by a group as well as by individuals. Chapters include Myths, Realities and Aging; Retirement and Aging and Boomers and Aging. New Beginnings: The Gifts of Aging by Richard Gentzler. [DVD] (Discipleship Resources, 2005) Shows a variety of creative church ministries that are being enjoyed by older adults: mission opportunities and teaching service abound in the stories told on the film. Lives are changing, transitions are occurring, and new beginnings are taking place for countless numbers of older adults in our congregations. Good for sparking creative ideas. Senior Adult Ministry in the 21st Century: Step-By-Step Strategies for Reaching People Over 50 by David P. Gallagher (Wipf & Stock Publishing, 2006) Offers insights, practical ideas, and successful strategies for ministering effectively to people over 50. A Vision for the Aging Church: Renewing Ministry for and by Seniors by James H. Houston (InterVarsity Press, 2011) Are we ready for the opportunities and challenges facing the aging church? Now is the time for the church to offer ministry to its increasing numbers of seniors and to benefit from ministry they can offer. This book issues an urgent call to reconceive the place and part of seniors in the local church. Confronting the idea that the aging are mostly a burden on the church, they boldly address the moral issues related to caring for them, provide examples of successful care-giving programs and challenge the church to restore broken connections across the generations. Guide to the Spiritual Dimension of Care for People with Alzheimer's Disease/ Related Dementia: More Than Body, Brain and Breath by Eileen Shamy (Jessica Kingsley Publishing, 2003) This is a book for those actively engaged in or interested in spiritual ministry to persons with dementia. Shamy draws heavily upon her experience, making this book very personal in its approach. Emphasizing the importance of retaining dignity and freedom of choice for people with dementia, it also presents practical advice about memory cueing and provides frameworks for leading worship for those with dementia. Aging Is a Family Affair: How to Prepare for Tomorrow's Difficult Caregiving Conversations-Today by Mary Ann Massey, Ed. D. (Crossword Publishing, 2011) Collecting 33 unique family case studies derived directly from patient experiences, formally conducted interviews, and informal encounters and anecdotes, this resource illustrates several inevitable lessons that reinforce the pressing need for families to engage aging loved ones sooner, not later, about long-term elder care, loss, and end of life planning. Clear, reassuring, and practical advice. How to Care for Aging Parents: A One-Stop Resource for All Your Medical, Financial, Housing, and Emotional Issues by Virginia Morris (Workman Publishing, 2014) An authoritative, clear, and comforting source of advice and support for the ever-growing number of Americans--now 42 million--who care for an elderly parent, relative, or friend. Voices of Aging: Adult Children and Aging Parents Talk with God by Missy Buchanan (Upper Room Books, 2015) This nationally recognized older adult advocate offers a compassionate look at the concerns of two generations—adult children and their parents—as they struggle with the fears and frustrations of aging. At the Edge of Life: Conversations When Death is Near by Richard L. Morgan (Upper Room Books, 2014) Thirty devotions that offer perspective and advice to people coping with a family member, friend, or patient who is approaching the time of death. Don’t Write My Obituary Just Yet: Inspiring Faith Stories for Older Adults by Missy Buchannan (Upper Room Books, 2011) Buchanan offers a glimpse into the lives of active, giving, and prayerful older adults who are seventy, eighty, ninety, and even one hundred years old. Readers explore what it means to develop a deep attitude of gracious acceptance of the life God has given them. And with each account, Buchanan relates what it means to live out a life that has a strong spiritual foundation. Fierce with Age: Chasing God and Squirrels in Brooklyn by Carol Orsborn (Ingram Publisher Services, 2013) In her breakthrough generational memoir, Boomer expert Carol Orsborn relates the ups and downs of a tumultuous year spent facing, busting, and ultimately triumphing over the stereotypes of growing old. Along the way, she nurtures a love-starved friend through a doomed affair with a younger man, wrestles with the meaning of an exploding fish, and regains her passion for life at the side of her squirrel-crazed dog, Lucky. The message is as deep as it is engaging. No Wrinkles on the Soul: A Book of Readings for Older Adults by Richard L. Morgan (Wipf & Stock Publishing, 2013 – new issue of an old classic) From "No Use Denying It" to "Keeping the Spirit Renewed," Morgan offers six themes in his best-selling book, which is now in larger print, that are on target for older adults. The 62 meditations in No Wrinkles on the Soul are ideal for individual or small-group devotions for those seeking to further develop their spiritual wisdom. Each meditation presents a suggested scripture reading, a printed Bible version, and a reading for reflection. These meditations relate honestly to the variety of situations in which older adults may find themselves living -- in their own home, in a retirement center, in a nursing home, or in the home of a relative.Not listed by Cokesbury but it is on Amazon.